Riad Al Janoub on ikivanha kauppiaan talo, joka on kauniisti kunnostettu tyylikäs ja nykyaikainen marokkolainen tyyli. 4 Tyylikäs ja viihtyisät huoneet on järjestetty noin sisäpiha palmuja ja kaunis mosaiikki suihkulähde. Kaikissa huoneissa on kylpyhuone, joissa on ilmastointi ja iPod haltijoille. Huoneet on sisustettu käsin veistetty huonekalut, matot, peilit ja koriste peräisin souqs Marrakech. Kaikki kylpyhuoneet on sisustettu perinteisillä tadalekt käsin lyöty kuparin pesualtaat ja kaunis Marokon lyhtyjä. Kattoterassi, jossa on appelsiinipuita, on suuri katettu oleskelutila ja 3 aurinkotuoleja - täydellinen paikka rentoutua auringossa tai nauttia ilta-auringosta-Downer. Meidän taloudenhoitaja ja kokki, Amina, tervehtivät sinua saapuessasi kanssa minttu teetä ja valmistella teitä perinteinen marokkolainen aamiainen. Lounas tai päivällinen voidaan järjestää myös pyynnöstä tarjoilla ruokasalissa, salonki, tai kynttilän valossa kauniilla terassilla. Huomautuksia majoituksesta: - DVD-soitin / TV ruokailutila - IPod haltijat kaikissa makuuhuoneissa - CD-soitin pihalla - Internet ja langaton internetyhteys (tulossa) -Amina, Meidän taloudenhoitaja ja kokki, valmistaa perinteistä marokkolaista aamiainen ja pyydettäessä voi tehdä lounasta tai illallista liian. Jos kuitenkin haluat käyttää keittiössä on liesi, jääkaappi-pakastin ja pesukone. Amina on käsillä kaikkiin tarpeisiin. Pyyhkeet (sekä kylpyhuoneet ja kattoterassi) tarjotaan ja liinavaatteet vaihdetaan säännöllisesti. Ulkopuolella: Kaunis kattoterassi - toisin kuin monet muut Medina - on täysin yksityinen, ei unohdetaan muut Riads. Sen oranssi puita, aurinkotuoleja ja katettu oleskelualue, se on ihanteellinen auringonottoon, auringon Downers tai illallisen tähtitaivaan alla. This is a really lovely house and conveniently located for seeing the sights in the medina and elsewhere. The owners were very responsive with information and Brahim and Amina were very kind and super helpful. Everything was clean and comfortable and very pretty. So glad you had a good time, Alexa! Welcome back any time! We hebben een geweldige vakantie gehad. Voor het eerst in een Riad verbleven en het was een leuke ervaring, we kwamen niets te kort. Wij waren er 5 dagen met 8 volwassen en een baby van 6 maanden. Leuke traditioneel ingericht net als bij de locals. Brahim en Amina zijn geweldige hosts, ze stonden letterlijk dag en nacht klaar voor ons. En ook de eigenaar was goed bereikbaar via mail. Het ligt heel centraal 15 a 20 min van de airport en van de El Hafna plein. Echt een aanrader, wij gaan zeker nog een keer terug. So glad you had a great stay! And, yes, Amina and Brahim are indeed fabulous. You are of course very welcome back any time. We had wonderful time at this Riad, the rooms are well appointed and the beds are comfy. Breakfast was simple but wholesome enough to give us a good start each morning to explore Marrakesh. Jama El Fina is about a 20 min walk from the Riad. Brahim was the best host ever ! he was there each morning to help and support, he arranged a city tour for us, advised on what to see, where to eat and where the best exchange rates were. Brahim was also kind to take us to his home for a lovely Eid breakfast and invited us to participate in Eid festivites with his family. He is a true gentlemen with a heart of gold. Brahim really did go out of his way to make Eid memorable in Morocco. Amina prepared breakfast each morning at a time of our choice, the only sour point for us was the 5 Euro per wash (yes Euros!!) to use the washing mahcine. Given this was supposed to be self catering accomodation and there was no mention in the listing we were taken back by this. We did explain to Amina that we would be purchsing our own laundry detergent etc. but she was insistent the charge was still applicable. Thank you for your kind review. You and your family would of course be very welcome to stay any time again! Our family of two adults and two teenage girls had a wonderful stay at Riad al Janoub for a week. 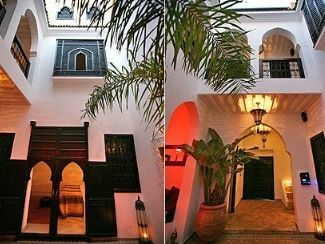 The riad is located in a quiet area, just inside the medina, and far enough away from the chaos of the souks. The rooms were beautifully appointed, the beds very comfortable, and the breakfasts prepared by Amina simple but sufficient to get our days off to a great start. And the rooftop terrace was a perfect place to spend the evening, after an exciting but often tiring day exploring the wonders of Marrakech. Indeed, we ended up ordering several takeout dinners from Kech Foods, about a five-minute walk away, so we could soak up the nighttime quiet and atmosphere. But we also patronized the Riad al Sinbad restaurant just steps away, and had a terrific meal. The only thing travelers should bear in mind is that it can be hard to find your way back from the souks, especially at night. Also, the WiFi can be a bit slow, but this is true wherever you stay in Marrakech, so it's really not a big deal. Still, the riad has a secret weapon, in our view, in Brahim, who was an excellent resource and fixer for our various overnight and day-trip excursions. Thank you James and Carolyn and Brahim and Amina for making our trip so wonderful and memorable! Thanks, David. So glad you enjoyed your stay. And, yes, we are so lucky to have Amina and Brahim! You are, of course, welcome back to Riad al Janoub anytime. It's a lovely relaxing place to stay and Amina will if asked cook the most amazing dinners as well as breakfast. We have been numerous times as have other friends and we love it. We enjoyed our stay at Riad al Janoub and especially found Carolyn and James incredible helpful with a host of information before our trip. Brahim and Amina are extremely friendly and helpful and Amina cooked us fresh bread, pancakes and/or cakes every day for breakfast (different every day) which was delicious. One thing we weren't expecting though was that Brahim (the caretaker) would be staying in the riad every night so we never felt that we quite had our own space, which for some people might not be an issue at all but for us was a little disappointing. In some ways this meant it felt a little more like staying in a hotel, but this may be welcomed by other guests. Certainly Brahim and Amina were delightful and welcoming so it's in no way a comment about them. It's a fair walk from the main square (about 25 mins) which meant that once we'd left for the day we tended not to come back until the evening. Consequently we made very little use of the lovely roof terrace except for breakfast. It's an easy and interesting walk in though so it wasn't really a problem for us. It was quite cold in the evenings during our stay so we were very grateful for the heaters in the bedrooms. The communal sitting space downstairs though is an open courtyard and we had to keep requesting firewood for the evenings as it would have been very cold without a fire. Cafe Arabe, on the way into the square was a great place to stop off for drinks, and we also enjoyed the Marrakchi on the edge of the square. The food from the stalls in the square was good, inexpensive and with a great atmosphere. And don't miss the gorgeous coconut 'macaroons' sold in the square (usually by women with a single tray) for 1 DH each, which were absolutely delicious and eaten in fairly large quantities by the four of us! All in all, a good authentic experience of staying in a Moroccan house in the medina in Marrakech. Many thanks to Carolyn and James. Thanks for the review and very glad you enjoyed your stay. As for Brahim staying overnight, this is what happens at most Riads which are in effect Moroccan-style B&Bs - in other words, staffed accommodation. Sometimes our guests prefer not to have the staff on hand in which case Brahim is very happy to leave in the evening - if you book exclusive use it really is a matter for the guests at the time. February can indeed be cold - glad you made use of the open fireplaces! Many thanks once again for staying with us. Aavikkosafarien retkiä Atlas-vuoriston, ja quad-pyöräily kaikki saatavilla pyynnöstä. Essaouira on noin 3 tuntia autolla. Sininen ja valkoinen rannikkoalueella on oma Medina, ja hankkii yhä maine surfing ja purjelautailu. Siirrot (joko päiväretkiä tai yöpymistä) voidaan järjestää pyynnöstä. Marrakech Menara (RAK) on moderni kansainvälinen lentoasema ja vain 7 kilometrin tai 10 kilometrin päässä Medina. Olemme iloisia voidessamme järjestää kuljetuksia ja päässä lentokentältä pyynnöstä. Riad Al Janoub on sydämessä Medina, vain muutaman minuutin kävelymatkan päässä vilkkaalta souqs ja hämmästyttävä Jemaa El Fna. Olemme lähellä useita tyylikkäitä ravintoloita ja vain 2 minuutin päässä Yacout, kenties kuuluisin ravintola koko Marrakech. Booking Notes: We offer exclusive use of the whole riad for £100 a night (including breakfast). For a stay of a week, however, we offer exclusive use for £600 (including breakfast). Also, if you are an individual or a couple we can offer you a room within the riad (on a non-exclusive use basis) from £50 a night (including breakfast). We ask for a deposit of 25% on booking, payable by PayPal or bank transfer. The balance is payable 14 days before arrival or (on request) on arrival. Changeover Day: Check out time 11.00 am (although guests are of course welcome to leave luggage and spend time in the riad if waiting for evening flights). Check in time 2.00 pm (although guests are welcome to arrive earlier if coming on early morning flights). All prices include a traditional Moroccan breakfast each morning as prepared by Amina, our housekeeper and chef.